After being named Driver of the Year, I feel a bit more pressure because now I am being watched a little bit more. As far as what I was feeling when it was announced, it was like, “Wow!” Since then I have gone from total shock and amazement to mellow. I still feel honored and privileged. I feel very humbled when I am at the Irving yard and one of the new hires walk up to me and says, “I know you. You’re all over the website and Facebook for NCI.” It’s also happened out here on the road. magazine, and an international press release from the Kenworth Truck Company. 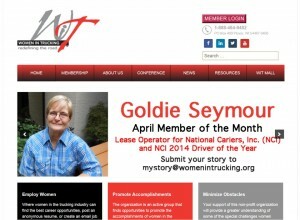 Several media outlets interviewed me for articles including: OOIDA, National Truckin’ Magazine, Go By Truck, Women in Trucking, and my hometown newspaper in Wagoner, Oklahoma, the Wagoner Tribune. I feel very blessed to be able to represent NCI as well as both men and women in this industry. NCI is a very well-respected company out here on the road. National Carriers has a very good reputation for how they treat their drivers, and I feel honored to be able to be the face of NCI. It’s been a great experience, and just to let everyone know, I’m still here to help promote NCI in any way.